Shaun Wane has spoken publicly for the first time about his future since yesterday’s bombshell announcement of his Warriors departure at the end of the season. And he insists he has not agreed a deal with any other club. His decision to step down as Wigan coach later this year has heightened speculation linking him with Catalans and roles in rugby union. But Wane says he has nothing in place and his keeping his options open. Wane has not ruled out switching codes – or even sports – and has not limited himself to working in the UK after declaring in yesterday’s statement he wanted a change of direction and a fresh challenge. “I’m open-minded,” he said. “I like to travel, I like other sports. “I’ve a lot of knowledge of a high-performance department with a great model, so I’m not ruling anything out. Rumours linking him with Catalans have been simmering for weeks, possibly due to their capture of Sam Tomkins so soon after Micky McIlorum’s signature. But Steve McNamara appears to have transformed their fortunes and is thought to have the support of club owner Bernard Gausch. Wane has previously been linked with a defence coach role with the Scotland RU team. This is his seventh season in charge of Wigan – during which time they have won a Challenge Cup, a World Club Challenge, a League Leaders’ Shield and two Grand Finals, as well as being beaten finalists on three occasions. They are also well-positioned for a three-pronged silverware assault this year. 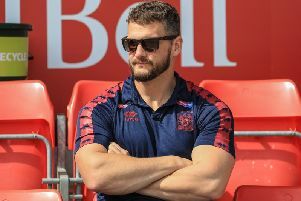 He informed the players and staff yesterday morning as Wigan released a statement confirming he had tended his resignation from the end of the season. “It was emotional – both ways,” said Wane, who will face a media conference at lunchtime today. “None of them had any idea. “And neither will they be able to tell over the next few months. “We’ve got a special team here and we all want to make sure we achieve things this year – and that’s what all the energy and focus is on now. “I get it, I understand the interest, but I don’t like the spotlight on me. Warriors chairman Ian Lenagan says he will not rush to appoint his successor.